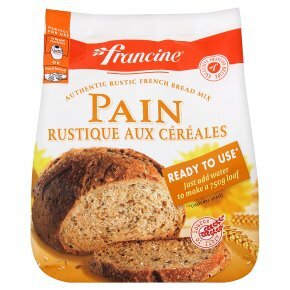 Authentic rustic French bread mix. Perfect for use in bread machines or hand baking. Ready to use includes yeast. Just add water to make a 750g loaf. Exclusive Francine recipe. Source of fibre. Instructions Bread Machine Put 300 ml of cold water along with the contents of this bag into the machine. Switch on using the white Bread program. Handmade Pour the contents of this bag into a large bowl. Mix in 300 ml of warm water. Knead well or use a mixer for 5 minutes until you have a good elastic dough. Cover the bowl and leave in a warm place for 30 minutes. Shape the dough into a ball and put on a greased baking tray. Cover with a bowl and leave in a warm place to rise for 50 minutes. Set the oven to 240°C / gas mark 8. Uncover and cut a shallow cross into the top with a knife. Dust with flour. Put a small bowl of water onto the tray next to the loaf and put it in the oven. Lower the oven to 210°C / gas mark 7. Bake the bread for around 35 minutes until the crust is golden. Allow to cool on a rack.